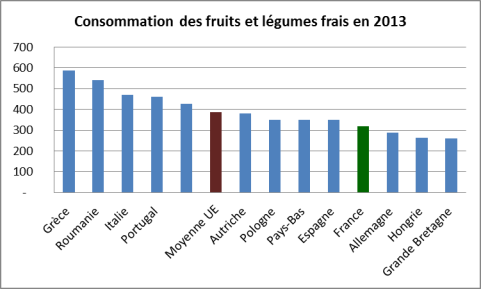 In Europe, the consumption of fruit and vegetables is below the international recommendations (400g/day – WHO) and national standards (at least five portions of fruit and vegetables per day in France – National Nutrition Health Program). A 2002 European study, conducted in 27 centres over 10 countries, highlighted insufficient consumption of fruit and vegetables in numerous countries1. Out of the 28 member states of the European Union, 22 were below the the World Health Organization (WHO)2 recommendations. The graphic below shows fruit and vegetables consumption per person per day. It is clear that the average European citizen’s consumption is below the international recommendations which is confirmed for France with an average consumption of 320g a day. Moreover, a recent study has shown that over 85% of Europeans do not reach the advised goal of 5 fruits and vegetables a day. 34.4% of Europeans over 15 years old do not even have one serving a day. Despite increased efforts made worldwide in order to improve nutrition, the results of these actions remain mitigated as international and national recommendations are not met.